Accelerators are a technology used in a wide variety of fields that have been producing excelent results in re- search on the origin ofthe universe, cancer treatment, and analysis of the structure of mater.Any device that can accelerate charged particles can be called an accelerator and there are several methods of accelerating particles, for example, applying voltage electrostatically, using electromagnets, and using high frequency resonance by accelerator cavities, but the most appropriate method is chosen for the application and the type and energy of the particles. Recently, accelerator cavities for which niobium is cooled to the superconducting state are mainly used for MeV to GeV linear accelerators. Large superconducting accelerators are being constructed around the world, such as the European XFEL in Europe, LCLS-II in the U.S., and RISP in South Korea. The International Linear Colider (ILC) project in Japan has been proposed1). Nio-bium materials used in such facilities must be highly pure because they are used in the superconducting state that is sensitive to impurities. The upper limit on the amount of impurities are specified in the ASTM standards as the high purity superconducting grade (ASTM Type 5)2). Nio-bium is rather expensive among pure metals and there are still some problems with technologies for mass-pro- ducing accelerator cavities at present, so technologies for manufacturing accelerator cavities at low cost with high productivity are demanded. The authors have taken a two-pronged approach to developing superconducting accelerator cavities in order to solve the problems mentioned above. The first is to establish a technology for refining high purity niobium ingots. The goal is to discover a technology for supplying niobium materials that provide the required purity and acceleration performance at the lowest price possible. 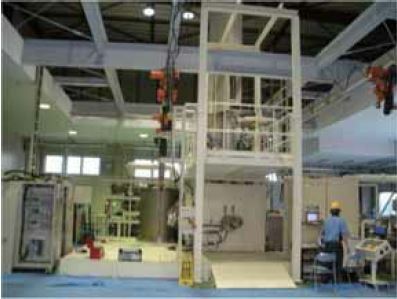 A 600-kW electron beam melting furnace has been introduced in the factory of ULVAC Tohoku, Inc. to develop methods for manufacturing such niobium in- gots. The second part of our approach is a manufacturing technique called the seamless method. In this method, niobium seamless tubes that are produced by an ULVAC original technology are directly formed into cavities. The aim is to establish a method to manufacture superconducting accelerator cavities at a lower cost than those manufactured by the welding method3),4) that is mainly used at present. Some research has suggested that the seamless method in which no welding is required for the main bodies of accelerator cavities has cost advantages5),6). We believe manufacturing costs need to be closely reexamined throughout all the actual processes from purifying raw materials to processing accelerator cavities, as ULVAC has been doing. This paper introduces ULVAC’s two-pronged approach to improve the purity of niobium and to prototype super- conducting accelerator cavities by the welding and seamless methods along with their characteristics. Figure 1　600 kW electron beam melting furnace. In order to manufacture high purity niobium ingots by electron beam purification, it is best to purify them at high power under high vacuum to effectively remove impurities, especially gases and high melting-point metals. ULVAC has commercialized metal products manufactured by electron beam melting. By using techniques accumulated through such development projects and the advantages we have as a vacuum equipment manufacturer, ULVAC designed a 600-kW electron beam melting furnace for manufacturing high purity niobium. Figure 1 shows the appearance of the electron beam melting furnace. After the furnace was first put into operation, melting tests were carried out dozens of times in order to figure out the conditions required for high purification. In this field, the residual resistivity ratio (RR) is usually used to evaluate purity. This value is often included in specification values when accelerator materials are purchased. The formula below shows the RR for niobium7). This formula shows the ratio of electrical resistivity at 300K to that at 9.3 K. The superconducting transition temperature of niobium is approximately 9.3 K. At the moment when the temperature falls below this value, the electrical resistance becomes zero. The finite number immediately before superconducting transition is used in the formula. In this state, lattice vibration ceases and so almost no electrons will scatter. Therefore, it can be concluded that electrical resistance is only caused by scattering due to impurities. Thus, the RR is used as an index for judging the amount of impurities. As the purity gets higher, the RR value becomes larger. In the ILC project, the RR required for niobium mate- rials is more than 250 as specifications. Currently, high purity ingots that satisfy such a value can be produced using this melting furnace (Figure 2). When the furnace was first introduced, its ultimate pressure, electron beam irradiation power, irradiation method to materials, and other maters were being adjusted, so a particularly high RRR could not be achieved. Around the 30th trial, we started to understand the relationship between all the variable parameters and the RR to some extent, so it started exceeding 250 after the 30th trial and reached as high as 650 under some conditions. Note that it is not that the RR values varied under the same melting purification conditions (after the 30th time, in particular). The variations in the data are because of differences in the melting conditions depending on the purpose. 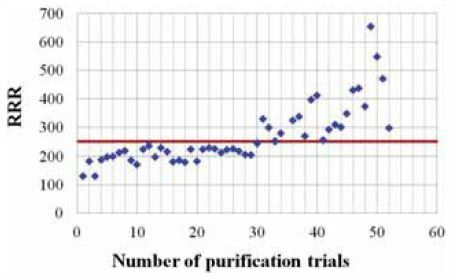 For example, in one trial we attempted to satisfy the specification value in a shorter amount of time (low cost process) and tried to get the highest purification effect (high RR) in another. Table 1 shows the chemical analysis results of an ingot with an RR of 330 as a typical example of high purity. This shows that the ingot is high purity superconducting grade (ASTM Type 5) . Table 1　Impurity element analysis of Niobium ingot and ASTM Type 5 specification. 3） T. Yanagisawa, et al. : Proc. 27th Linear Accelerator Conf（. 2014）1084. 4） T. Dohmae, et al. : Proc. 7th Int. 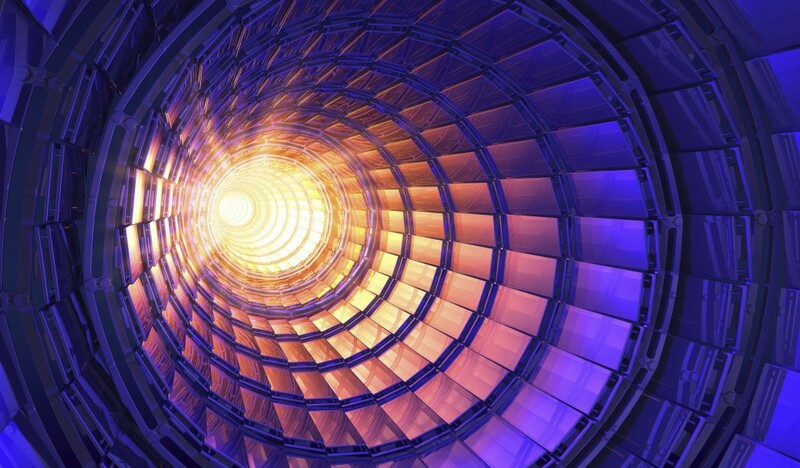 Particle Accelerator Conf（. 2016）2141. 5） W. Singer, et al. : Phys. Rev. ST accel Beams, 18（2015）022001. 7) W. Singer, etal. : TTC Report 02 (2010). 8) T. Shishido, et al. : High EnergyAccelerator Seminar,6 (2014). 10) T. Nagata et al. : 7th Int. Particle Accelerator Conf.WEPMB027 (2016).